The nightmare of any musician is to wake up one morning and find their instrument cracked or warped. That condition is caused by weather conditions that threaten the safety of wood instruments. Although problems with dryness have caused repair bills that run into thousands of dollars each year, the trouble is even more serious today due to central heating and air conditioning. With air travel, rapid changes in climate have become yet another source of difficulty because such changes are hard on the instrument. 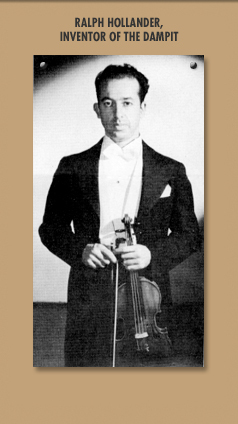 The inventor of the DAMPIT, Ralph Hollander, began his search for proper humidification of his own instruments by hanging his violin in the bathroom over a tubful of water, keeping his instrument surrounded by half-drowned plants, and setting pans of water on radiators. None of these methods got to the heart of the matter the inside of the instrument, unprotected by the varnish that coats the outside. One morning, Hollander experienced his own nightmare when he awoke to find his valuable old Italian violin cracked. The repair bill was stiff and he was determined never to let such a calamity happen again. He decided to research the problem by asking two questions: What happens to thinly cut wood that was originally seasoned in an area of high humidity but which is put to use in an area where the humidity is low? Also what would happen to wood of this kind if the seasoning process and the place of use was reversed? In answering these questions, Hollander realized that it was the raw inner surfaces of the instrument that are particularly susceptible to absorbing and losing moisture. He figured that the humidification had to reach inside the instrument to be truly effective. Hollander began to experiment with different instruments, different sizes of sponge and the punching of different sized holes in the covering for continuous but controlled release of moisture. After much testing, he produced a product that he called the ‘DAMPIT’ which keeps an atmosphere of humidity just high enough to maintain the optimum conditions for the instrument. the DAMPIT’s first customer was Jacques Francais, master violin restorer of his time. Although this prominent person supported the new invention, other musicians laughed at it as if it were a gimmick. With time, however, musicians approached Hollander, asking him to make the dampit for their instruments. 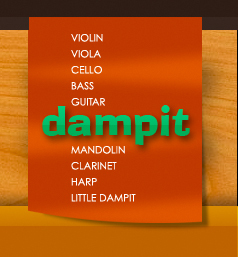 Eventually, master musicians all over the world began to sing praises of the dampit because it provided the first real solution to the dryness, cracking and warping of wood musicians had battled for centuries.